The title comes from the term ‘’Seven Sisters” which refers to the seven skyscrapers in Moscow. All seven buildings were built in just 9 years (1947-1956). Stalin came with the idea to build the skyscrapers in order to show the world the power of his regime and to celebrate the victory in the Second World War. Also it was an answer to the American architecture and it was important for Stalin to show that Moscow was as good as any other major capitals of the world. There was meant to be eight skyscrapers, but because of Stalin’s death, the eighth one was never built during the soviet time. However in the beginning of the new millennium, during the reign of the ex mayor Luzhkov, the eight skyscraper was build. The term itself is rather strange as it is only used by the foreigners. In Russian they are called ‘Vysotki’ or ‘Stalinskie vysotki’ meaning "(Stalin's) high-rises" (or "Stalinist skyscrapers"). It is not exactly clear why western people started to use the tittle ‘Seven sisters’ to refer to Moscow skyscrapers as this term was coined in the 1950s by the businessman Enrico Mattei, then-head of the Italian state oil company Eni, to describe the seven oil companies which formed the "Consortium for Iran" cartel and dominated the global petroleum industry from the mid-1940s to the 1970s. 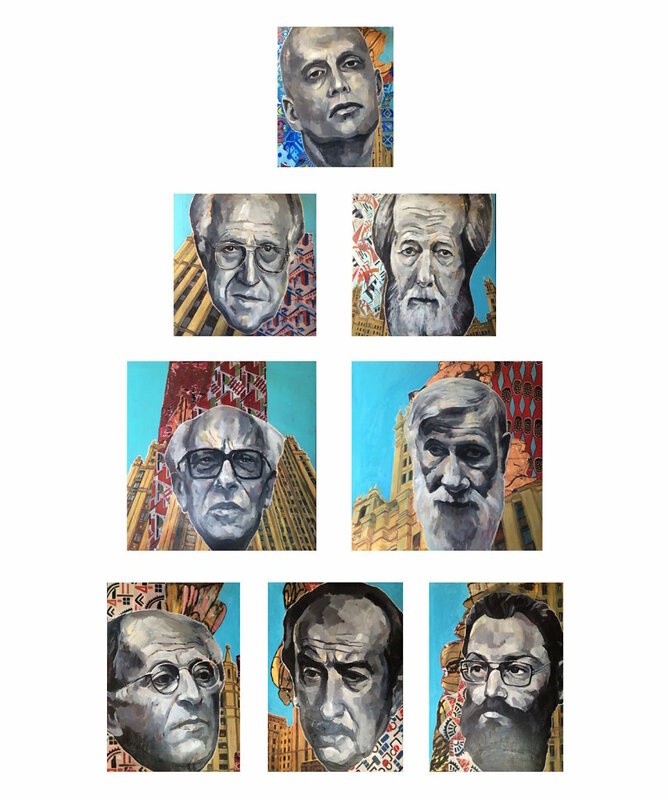 Seven out of eight faces within this work are soviet dissidents. All of them were oppressed by the state and either were sent to ‘Gulag’ or left the country because they could not say or express what they wanted. The eighth face at the top is Alexander Litvinenko. He can hardly be considered as a dissident but he is a victim of the system, which he was part of and he himself was the heritage of the soviet totalitarian regime. The pattern elements which are used in the paintings are taken from the soviet propaganda decorative arts and mostly reflect the ideology of the communism. The only contemporary pattern is in the painting with Litvinenko and it is taken from official Sochi Olympics patterns, which reflects distasteful approach of the current government. Also each painting forms a symbolic ‘window’ which refers to the very famous phrase from Pushkin’s poem and a historic question whether Russia is part of Europe or not. And today this question is highly important as Western countries still sense aggression and constant threat coming from Russia. The work is concerned with the notion of freedom of thinking and speech, which are constantly abused nowadays. It is some kind of a monument or a gravestone for those individuals that decided to fight the systems. Alike the skyscrapers, which were meant to demonstrate the power of the soviet system, this work in the form of a skyscraper, symbolizes the need to speak and not to be silent.